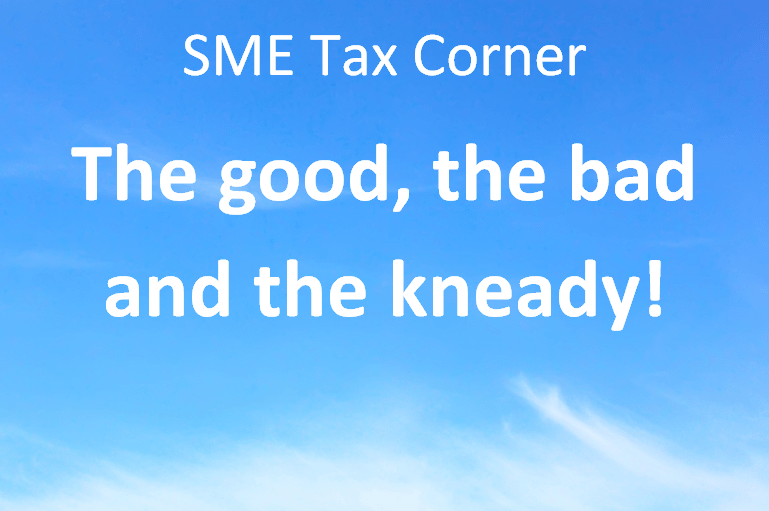 SME tax corner – the good, the bad & the kneady! In this month’s SME tax corner we look at the recent Summer Budget and what’s changed in the world of tax for small businesses. The recent Summer Budget was a bit hit and miss for small businesses. On the whole, though, it didn’t bring much good news. With small businesses dealing with auto enrolment and other rising costs, the timing of the introduction of the National Living Wage will not be welcomed by the small business community. The impact will of course vary from sector to sector, with small shops, hospitality firms, retailers and care providers set to face a real financial challenge. The cut to corporation tax, from to 20% to 19% in 2017 (and 18% in 2020) is undoubtedly good news for small and large business alike. As we have mentioned in this editions ‘the good, the bad and the kneady…’ the change in the way dividend income is to be taxed is a particularly big blow for entrepreneurs. The change will significantly reduce the tax advantage of taking dividends rather than salary. In contrast, the certainty given to Annual Investment Allowance is excellent news, particularly as the concern was that the allowance would be cut to £25,000. The government is encouraging investment and that is good news, for all businesses. Tax will always be an issue, but it will also always bring opportunities. Are you maximising your tax reliefs? The Chancellor announced that Annual Investment Allowance (AIA) will be set permanently at £200,000 from 1 January 2016. A welcome piece of news for many small business owners as the relief was due to reduce to £25,000. This new rate should see businesses, small and large, continue to invest in equipment, plant and machinery, and should lead to increases in productivity and output. We have more details here. One of the biggest announcements in the recent Summer Budget was a shake-up in the way income is taxed from April 2016. The announcement has added complexity to the current dividend system and the reaction has been, unsurprisingly, one of the confusion. What many small businesses owners do know, however, is that they will be hard hit by the change in regime. For example, if an owner makes £55k a year and pays themselves 30k as a salary and 25k as a dividend, they will see their tax liability rise by just over £1,600. Not good news for many entrepreneurs! We have more details, including FAQs and examples. Kneady: When dough means dough! R&D tax reliefs are available to those in the food industry throughout the supply-chain, whether its storing, packaging and preservation. Don’t miss out!